PLEASE CHECK OUT THE PREVIEW OF THIS PRODUCT!!! This product includes 50+ pages of materials!!! This product includes THREE DIFFERENT 10-PAGE BOOKS. 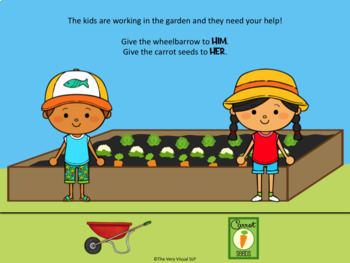 Each interactive book targets a different pronoun pair (he/she, his/her, him/her). Pages can also be mixed together to target all pronoun pairs at once! In addition to the books, this product also contains 8 cut and paste printables. 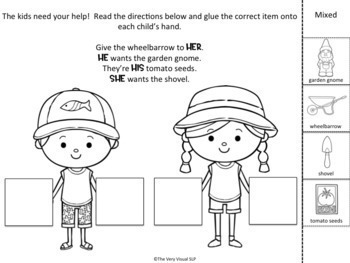 Two printables are included for each targeted pronoun pair. 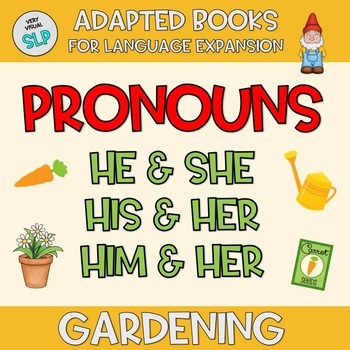 Two additional printables are included that targeted the pronoun pairs mixed together. Also included are individual pictures of the boy and girl, as well as a picture of both kids together. 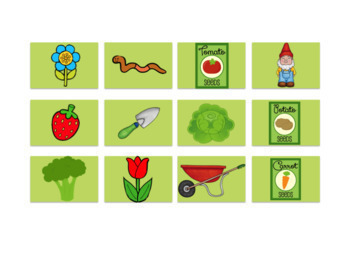 I use these as a following directions activity with the icons provided for the books.